Hi everyone…hope your week is off to a good start! Mondays can be tough but with it being MLK Day, you may be extending your “weekend” an extra day with no work or school. I’ve been a bit “absent” from the blog. Two reasons…1) I was asked to help with the props for my youngest daughter’s school musical later this month and I’ve been somewhat busier than normal working on those AND 2) I was receiving “technical assistance” with making an addition to my site. While that was being done, it was best not to write any new posts. So with some help, I’ve added a RECIPE MAKER…this template will allow readers to better view a recipe that I’m sharing. And the best part…you can print the recipe. Yay! Yes, I get excited over the little things! Of course, I’ll be sharing a recipe today. In fact, I’ll be sharing some all this week…QUICK BREAD WEEK! 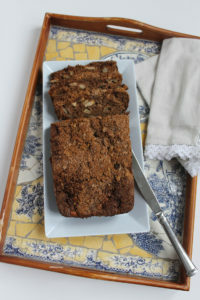 Today’s quick bread recipe is for apple cinnamon bread. 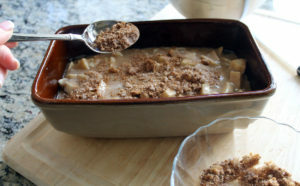 It is so moist and chocked full of apples and lots of flavor! This recipe calls for two sets of ingredients…dry and wet. 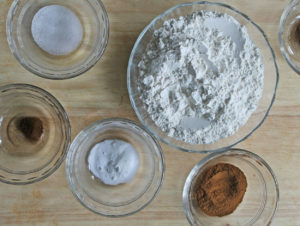 You mix together the flour, baking soda, salt, cinnamon, all spice, and cloves first. Then, the eggs are beaten…and you add the oil, applesauce, vanilla and sugar together. 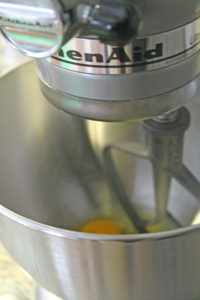 The flour mixture is added and combined with the egg mixture. And then you add the most important ingredient…the APPLES. 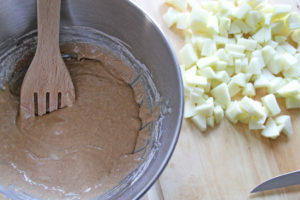 You can’t have apple cinnamon bread without the chunks of apples. 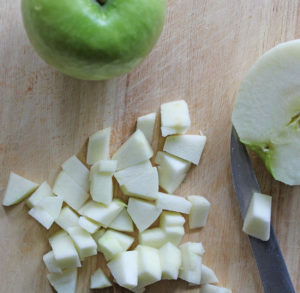 I prefer to use Granny Smith for this recipe. 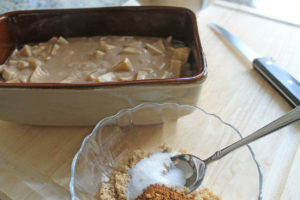 Now I know I just said the apples were the most important part, but this topping of brown sugar, cinnamon, and sugar is pretty good too! It gives the bread a crunchy sweetness on top. So yummy! 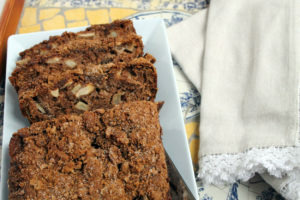 This is a quick bread that does not last long in my house! The minute it comes out of the oven, my daughters are asking to eat it. Now for that recipe maker I mentioned earlier…isn’t it great to have it in this format and be able to print it if necessary! Hope you like this feature as much as I do! Be sure to check back throughout the week for more QUICK BREAD recipes! 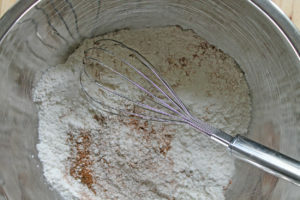 In a medium bowl, whisk together the flour, baking soda, salt, cinnamon, all spice, and cloves. Set aside. Beat the eggs on medium speed for about 30 seconds. Add the oil, applesauce, and vanilla. Mix until smooth. Then, add the sugar and combine well. 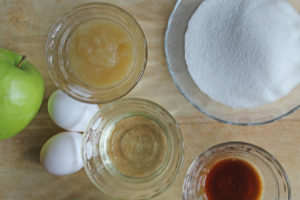 Slowly add the flour mixture until barely combined. 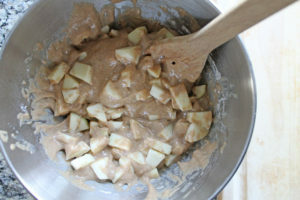 Fold in the apple chunks. 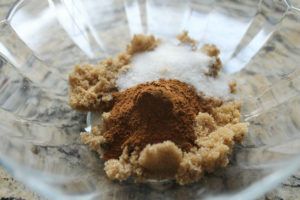 In a small bowl, mix together the brown sugar, cinnamon, and sugar. Sprinkle it over the batter in the pan. Bake for 50-60 minutes, or until the broad is golden brown and a toothpick comes out clean. Allow to cool in the pan for 10 minutes, and then loosen sides and remove from pan. Wow! This is so professional! But your blog has always been professional. And I must try this bread soon!